On order & randomness in Companion to An Untold Story. How did you decide upon the “companion” form for your memoir? A prior version of the book was organized chronologically and told a fuller, more conventional story about Joel. There was, for example, a much longer discussion of his relationship with his brother. At one point I thought I was writing a literary biography of a suicide under the mistaken assumption that if I put together a biography it would provide me with answers as to why he killed himself and what my role in his story was. But each account led me farther away from my subject. This earlier form implied that I had confidently grasped Joel’s life and death, whereas I was haunted by questions. What I discovered at nearly every turn was an inexplicable gap between the gifted man I knew and the man who suffered so many disappointments. Why do some people with modest gifts succeed, while others blessed with ability struggle to survive? Why can you help one person, while another person turns away your help? There are mysteries in this life, and I needed to find a form that allowed me to reveal them in this man, a truer picture of the aftermath of his death, the little pieces that I tried to assemble. What was my experience, my role? I needed to find a way to puzzle through my own unruly and mixed feelings. There is the story of Joel’s actions and there is the companion story of my actions in response to what his suicide set into motion. These are not neat strands running in parallel formation, but narratives that cross, tangle, knot, and break. This fragmentation and entanglement is reflected in the book’s form. It is modeled on an adult’s reference tool and guide to something already known called a “companion” (one of the books my friend gave us, for example, is the Oxford Companion to English Literature). The alphabetical approach imposes a kind of order, but an order that contains randomness within it, an order that undoes order. One thing I have learned is that suicide imposes a narrative on a life. The alphabetical form goes some way in counteracting that narrative inevitability. It is the reader’s task to assemble a story by means of the elements provided in my companion to it. I have also chosen the “companion” form to imply that the story it accompanies has weight, and the subject merits the treatment I give it, as much as Arthur Miller’s Death of a Salesman insists that his subject’s death is worth presentation as a tragedy. You resist filling in all the blanks, letting some facts emerge but making no attempt at a complete narrative or exhaustive portrait. Was this decision hard to keep to, or natural for you? What was hard was composing the early versions of the book in which I attempted an exhaustive account of Joel’s life, writing against the grain of what was essentially characterized by gaps, holes, incompleteness. My initial approach was at odds with the shape of Joel’s life. Once I found the right structure and realized what was mine to tell, everything got much easier. How did you decide what got what treatment, a sentence instead of a page? In some cases an aphorism came to me that struck a strong spark and seemed complete. Sometimes I worked against what I thought would be the reader’s expectation of a long discussion. Although in my remarks here I’ve emphasized the incompleteness of the story, the reader does need some background to make sense of things, and in some cases the material needed a longer, narrative form—for example, Joel’s history as a student. The fact that I had done the labor of producing a more complete book allowed me the freedom to carve a more nuanced and surprising book out of the material. I also wanted uncertainty, a variety of tones and lengths, to keep the reader’s ears pricked. Did you wonder as you worked what Joel would make of your efforts to depict his life, his death, and your relationship? Over a period of months Joel gave away or disposed of everything he owned. His apartment was empty when he died. I interpret his behavior to mean that he didn’t want to leave any record of himself behind. On that point I am defying his last wishes. I refuse to erase Joel from the records of the living, from love’s ledger, as I put in the Companion. We may not be able to save people from disaster, but we can remember and honor them—that is the intention behind my writing. I hope he would not say, were he to look over the book, that I’ve badly misrepresented him. What did you learn in the writing process? That writing isn’t emotionally cathartic! At least, I’m not a great success story for the therapeutic model. I can still go to pieces talking about Joel’s death. Recording the voice-over for the book trailer was pure misery. I was stepping back into the tangled mess of my emotions once again. I’ve learned that you don’t get to the end of any powerful experience and are done with it. Part of the reason I employed a system of cross reference in the book—a forward sweep that is simultaneously looping backwards, is to suggest there’s always another ripple in this dying business, in this business of feeling. Thus, even the final entry returns the reader back to the beginning through its cross references. I have, nonetheless, over the years achieved a measure of acceptance, even admiration, of what Joel did. In writing I found myself returning to my modernist training. I thought about the great quoting poems of modernism: T. S. Eliot’s The Waste Land, Ezra Pound’s Cantos, Hart Crane’s The Bridge, and Marianne Moore. Samuel Beckett is never far from my mind. I read Krapp’s Last Tape every year. 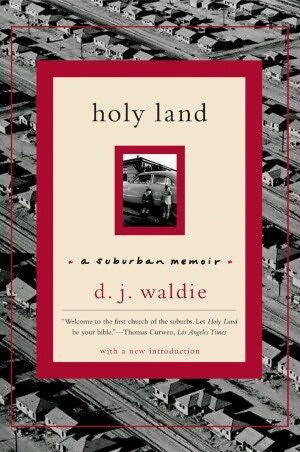 Closer to my time and within the field of memoir I have learned from Paul Auster’s The Invention of Solitude and D. J. Waldie’s Holy Land: A Suburban Memoir—a holy book to me. Richard, I think this post really helps flesh out (it’s ironic to say “flesh out,” perhaps, when talking about an episodic companion form, but I think it works that way anyway) what was contained in your previous post on Marcia Aldrich. Or at least, the two together paint a complete picture. It’s an interesting concept, the companion form, as I think I’ve said before. There is so much of value in Aldrich’s comments. I just reread her words, and I feel like quoting her again here word for word! It is so interesting that she tried to tell the story conventionally and found that didn’t work. Probably because she built up all that material, she could then find her way to the more unconventional but truer form the memoir eventually took. It’s heartening to know that finding the right structure…after what must have been a lot of process…made it easier at that point. It’s fascinating, too, that the structure she used reflected her own uncertainty, unsettledness, mixed feelings, remaining questions, etc. I haven’t read the book, but I definitely will now. Thank you for bringing it to our attention, Richard. Suicide is so shocking and leaves so many questions and so much pain. My closest experience with it was a serious attempt by a student I was particularly fond of, and I knew if he died I would never get over it. As I write this, the song Copenhagen by Lucinda Williams about news of a death keeps going through my head: “…you have disappeared, you have been released/you are flecks of light, you are missed/ somewhere spinning around the sun, circling the moon/traveling through time, you are missed.” Aldrich’s comments about how writing the memoir wasn’t cathartic for her and how “there’s always another ripple in this dying business, in this business of feeling” was beautifully put. I appreciate your thoughts, Victoria and Paulette. I too was heartened to read of Marcia’s struggle. I guess because I have struggled so many times with the structure of a more conventional chronological narrative. Her approach looked so freeing, and feels that way, that it’s a reality check to hear, hope, she had to flail around, too. Past a certain point of craft, all writers have to talk about seems to be presentation. That is, structure.